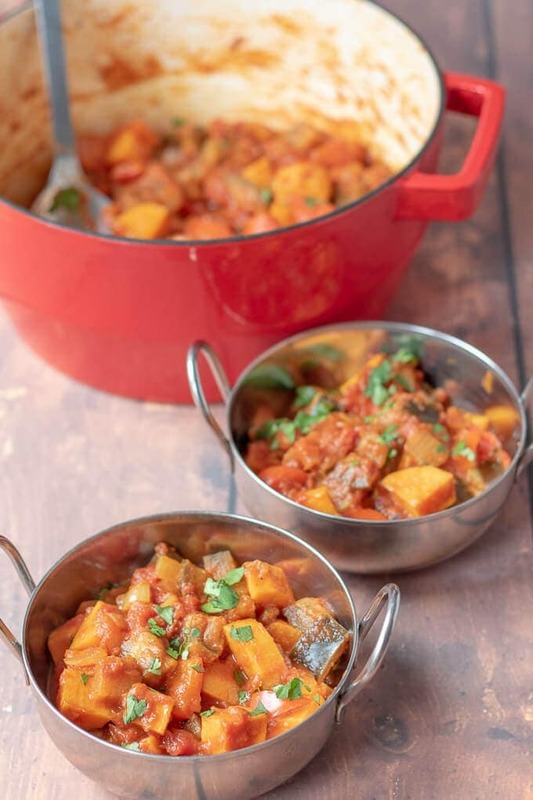 Aubergine and sweet potato curry is a simple and deliciously healthy vegan curry. An all in one pot hearty family meal ready in just one hour! Folks I’m really excited to finally bring you this amazing aubergine and sweet potato curry. I say “finally bring” because I first talked about it last year in the vegan mixed bean curry recipe! Forgive me for it taking so long but as it conjurs up so many wonderful holiday memories for Lady Lynne and I, I just wanted to get it perfect! To say it’s delicious would be a serious understatement! You see we first encountered it whilst on holiday in Zanzibar last year. When we were recuperating from our mammoth Kilimanjaro climb. We were staying at the Hotel Riu Palace Zanzibar and this curry featured most nights on their dinner buffet menu. In fact if it wasn’t there of an evening I became seriously disappointed! 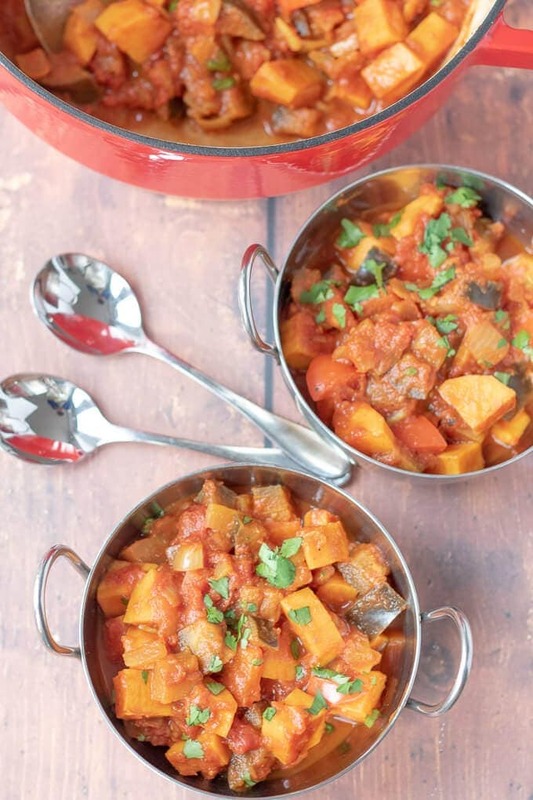 This aubergine (eggplant to my American friends) and sweet potato curry is the kind of meal where you just can’t stop going back for more and more! Plus as its packed full of vegetable goodness this is a healthy aubergine sweet potato curry at only 378 calories per serving. 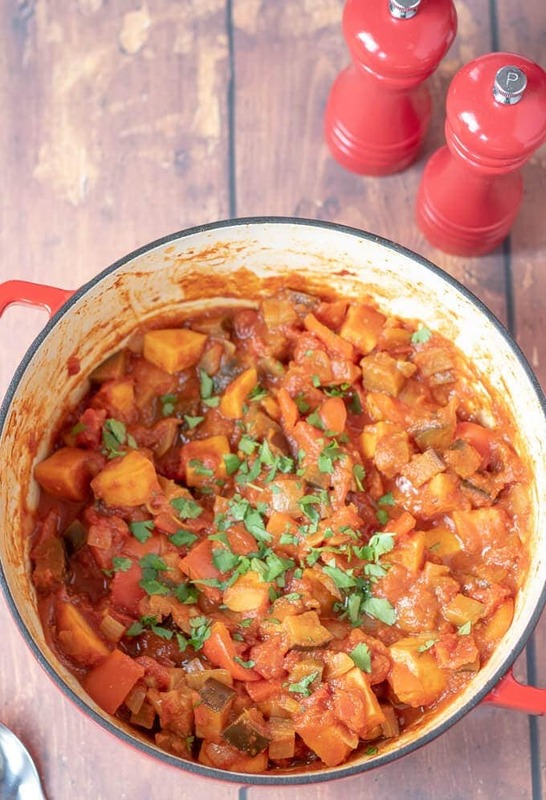 This curry is a simple mix of onion, ginger, garlic, aubergine, sweet potatoes, red pepper, tinned tomatoes and spices. The spices are a delicious blend. The unique combination of curry power, garam masala, chilli and cumin powder help to make this curry naturally sweet and with a slight but not overwhelming heat. Serve the curry with Home Made Naan Bread or with some basmati rice. Potato and spinach curry is not only vegan and low in calories but its exceptionally tasty, easy to make and ready to serve on your dinner table in less than one hour. Mung bean (moong dall) dahl is an absolutely delicious vegan curry. As a quick healthy meal it’s ready in an hour and for those watching their waistlines it comes in at only 259 calories per serving! Lentil sweet potato and chickpea curry is a tasty vegan and gluten-free quick healthy meal. A simple blend of spices and healthy ingredients combine to create this amazing dish! Well I don’t know about you folks but I can’t believe just how quickly April is passing by! It’ll soon be Easter Sunday and as we’re way overdue a new cheesecake recipe here, I’m going to sort that out next Thursday. I’ve got a delicious and easy No-Bake Mini Egg Easter Cheesecake for you. Perfect as an Easter treat. Any leftover curry can be kept in the fridge and reheated the next day. Or this aubergine curry can be frozen for a future delicious meal! Gently heat the olive oil in a large saucepan then add the onion. Sauté for 2-3 minutes until the onion softens then stir in the ginger and garlic paste. Add the aubergine, sweet potatoes, pepper and spices stir well and cook for 3 minutes. Add the chopped tomatoes, stir and bring to the boil. Turn down the heat, put a lid on and simmer the vegetables for 20 minutes until they are soft and tender stirring occasionally. Add a little water if curry becomes too thick. Divide between 4 plates with the chopped fresh coriander scattered over. Serve with naan breads or rice. Neil, I have never been one to indulge in a midnight snack but gosh – your Aubergine and sweet potato curry is making me want to! I love curry and this looks so good! I love your simple spice blend – it plays off he sweet potatoes so well! And what a lovly twist with the eggplant/aubergine in there – I don’t think I’ve ever had those two veggies combined in a recipe before – but I see how well they can jive! Hoping you and Lady Lynne have a wonderful weekend! I can’t remember ever having had these 2 veggies combined together before I had them in Zanzibar either Shashi! I was so taken with their combined taste that I just had to re-create it here! Glad you like the recipe. We’re just looking forward to a relaxing weekend. It’s not long before we’re off on our walking again. Hope you have a great weekend too! Love it! What a wonderful combination, and of course the cilantro on top makes this curry sing! 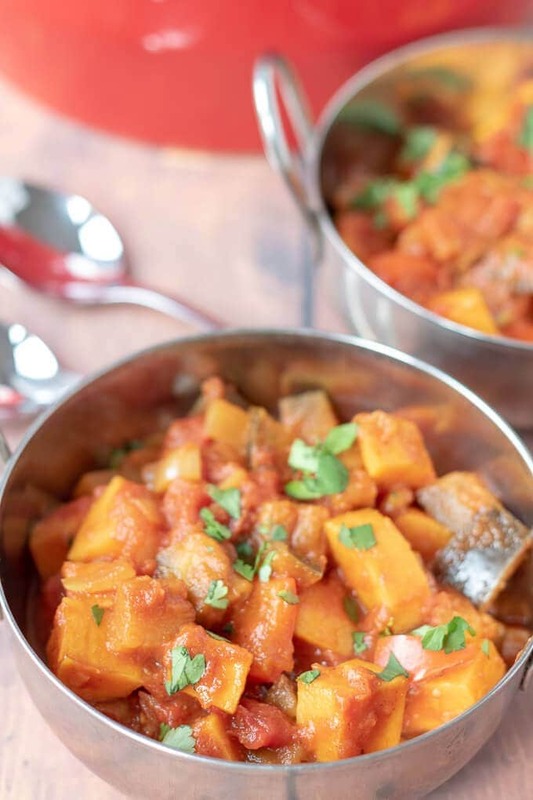 Neil, sweet potatoes and aubergine sound like a perfect match for a veggie curry. A definite must try recipe. Thanks for sharing. I always say that I’m not a huge curry fan. However, many years ago I tried eggplant (aubergine to our European friends :)), and it was delicious. That’s probably one of the only few ways I can enjoy a curry. And the addition of sweet potatoes sounds good too! What a great combination of flavors here, Neil! I hear ya on having a backlog of recipe ideas. I keep a calendar, and the margins are full of things I want to try my hand at making. Of course, most of them are desserts…haha. 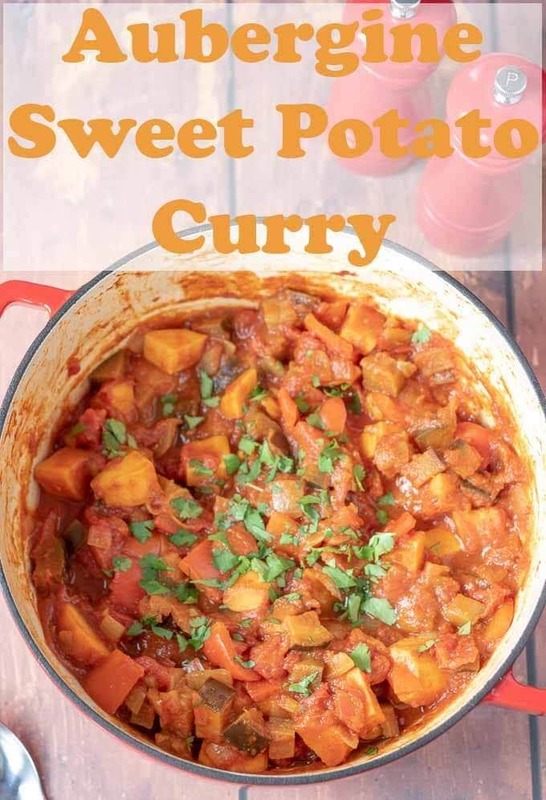 I’m all about this healthy curry, and sweet potatoes are definitely a favorite here in our house. Thanks for sharing this one! This recipe is 1000% GiGi Approved and it sounds absolutely out of this world delicious. Seriously Neil, I really need to get to the store to get ALL of these ingredients (I have sweet potatoes but I need the eggplant) to make this baby happen!!! What a great combination of flavor, Neil! I totally love this idea and plan on making it as soon as I can get to the grocery to buy aubergine (such a better word than “eggplant”!) and sweet potatoes! Thanks! 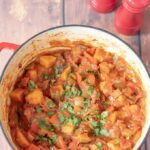 This curry looks so comforting Neil and perfect for the cold winter weather creeping in now. I love aubergine, but have never tried it with sweet potato… this I would love to try.